You wanted more ... and Jimmy delivered. 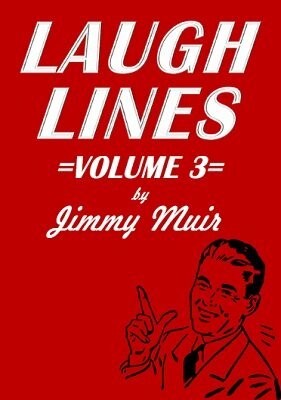 Here's the third hilarious installment in the Laugh Lines series, with even more jokes, gags, comic observations, one-liners and opening monologues for magicians, emcees, comedians and other entertainers. Jimmy Muir was acknowledged by many of magic's greats as the funniest guy on the planet. Whether it was performing at a huge national convention or emceeing the floor show at his San Francisco hotel, Jimmy's material was always top notch. The original Laugh Lines booklets are sadly out of print and jealously hoarded by magicians and comedians. Individual volumes are hard to come by—especially the later volumes, which are nearly impossible to find. Good news for entertainers is that the Laugh Lines collection is once again available in a new, fresh series. This revised edition replaces the occasional dated, pop culture bits and replaces them, on a one-for-one basis, with new, fresh material to liven up your club, close-up or stage act. Audiences love it when the performer, seemingly off-the-cuff, has an instant, ad-lib response to any situation. The secret is to simply remember a handful of your favorite lines from Jimmy's material and deliver them at the appropriate time. Now you'll always be prepared. 1st edition 1949, PDF 39 pages.